It turns out that Cechaflo would welcome the publicity generated by us working together. Not only would I feature him and his work on this blog, but also on Speedhunters. Can't beat that kind of publicity. Anyway, first order of business was to decide on where to source the leather. Because I am close friends with someone who is very particular about leather (Dino Dalle Carbonare of Speedhunters) I decided to ask him. He told me to try to get Poltrona Frau Pelle, who supposedly supply leather to Ferrari! Can't beat that. So I sent an email to them, but unfortunately after a few back and forths they were not able to help me. Frankly, not surprised at all. Cesar had some other suggestions, one which was Hydes Leather. These guys are located in Canada, but import hides directly from Italy. 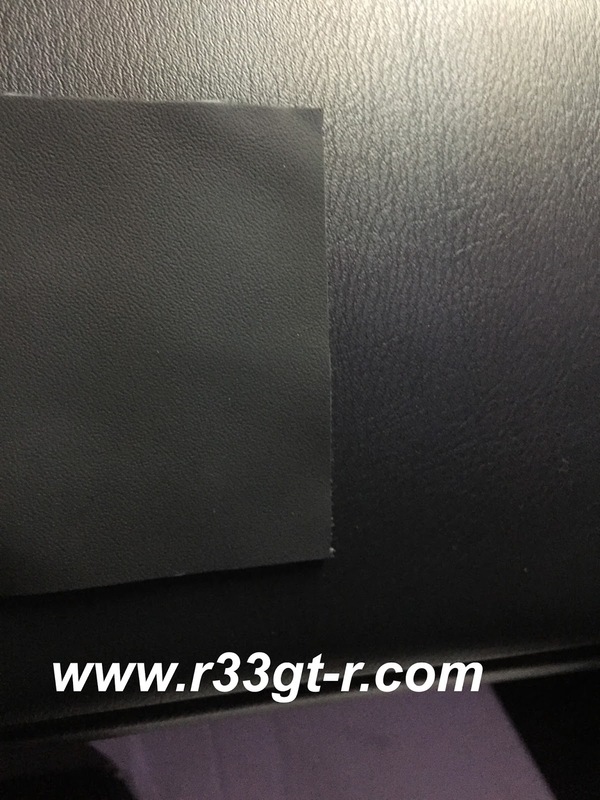 Further, what was interesting to me was, they offer OEM leather used by several hi end marks - yes, including Ferrari, Bentley, Porsche, and others. 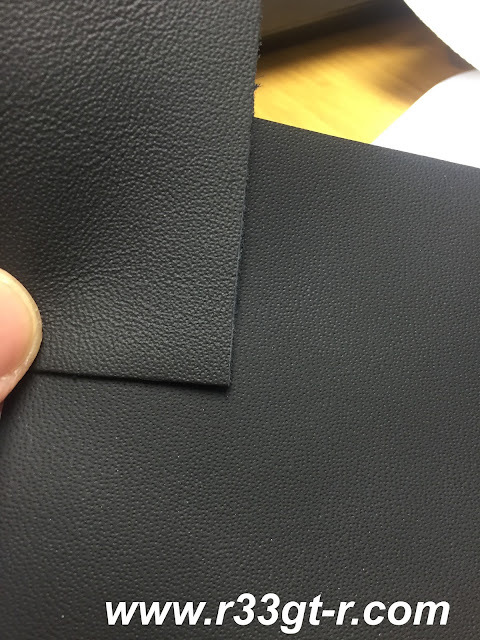 So I sent an email and soon had a swatch of black leather sent my way for comparison. I requested samples of leather in both dark grey and black for the 3 OEM brands I thought looked best on the website - Ferrari, Bentley, and Jaguar/Landrover. 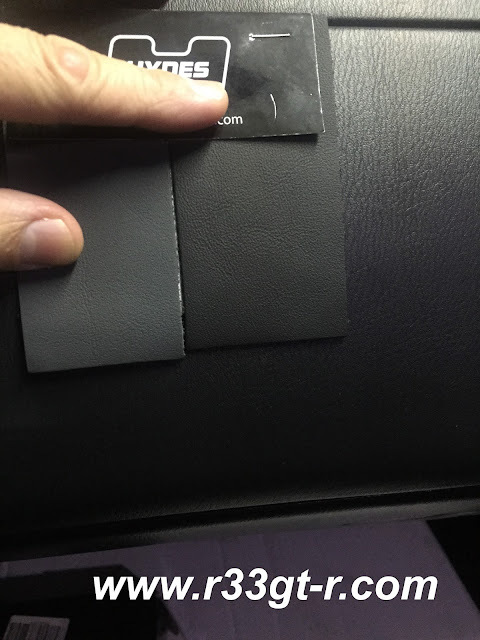 Once the samples arrived, I compared against the fake black leather in my car. Although I was drawn to Ferrari for the name, with the help of my friend Alessandro (whose blog, http://www.bnr34gt-r.com is a very nice read, even though it usually focuses on the wrong car...lol), I eventually settled on Bentley because it appeared darker, and had more leather like qualities like the feel and smell. I learned from Aaron, CEO of Hydes, that Ferrari leather is actually freeze-dried during production, which gives it a stiffer feel that other leathers. This is good for seating surfaces that require durability, but not necessarily so for other interior areas which are glued down anyway. I just bought my R33 a couple of months ago and one of the first things I've wanted to correct was the "cheap" feeling of the interior. If I was to go a similar route as you with leather and all that, what could I expect to pay? Second, how do I get in on the Club R33 FB group? Well, it depends on where you source your leather, as well as what your leather craftsman will agree to. But, I can tell you, it's not cheap. And, you get what you pay for, I think. For Club R33, assuming you have a FB account, tell me what your email address is and I will send you a link to join. Looking forward to the add. Been reading up on your blogs lately, and your improvements are great man. Myself being an American in Japan, what's the cost to have all the leathers shipped here? Also would love to get an add to the R33 Facebook group. Deezy.breeze@ymail.com. DeAndre' Bray is my name.